After you've got the two- and three-letter words down, you could try and do the obvious step up, the four-letter words. But there's over 4,000 in the Official Tournament and Club Word List (OWL) and over 5,000 in Collins Scrabble Words (CSW). That's a lot of words. But then what? What if you wanted to skip all the way up to the seven-letter words to maximize the potential for bingo (bonus) plays on the board? You could do that, but the amount is even greater, with over 24,000 in the OWL and over 33,000 in CSW. No matter which way you choose, you've got a lot of work ahead of you. Another way to go is by learning all of the words with variant spellings. Recognizing every possible variation of a word is great knowledge for the Scrabble board. You can call them synonyms, but they're not quite synonyms, which refers to words that are spelled differently but generally mean the same thing, like BUY and PURCHASE. If you're keen on learning the definitions of all of the words you study (an impossible task! ), the variant spellings are the best place to start after two- and three-letter words. If you know the definition of JINN, then you know the definition of 8 other words. It's a good way to weed out a bunch of words at once—plus it's fun! So, this week's challenge is based on variant spellings, and consists of an opinionated question and a tricky game puzzle. What's your favorite word with multiple variants? Share them in the comments! Mine would have to be the JINN and GANEF families above, because of the number of variants. 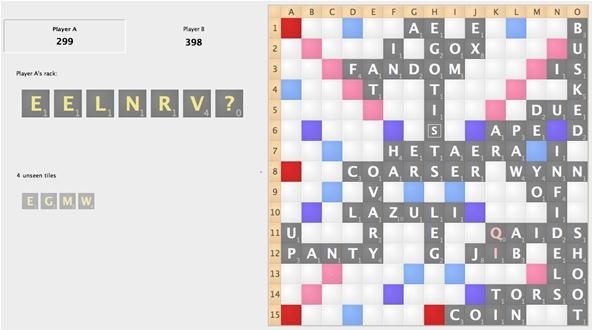 In the game below, you are Player A, and you're losing 299 to 398 with a rack of EELNRV?. But the game isn't over yet. Use your Scrabble bingo skills to spell out an eight-letter word that is a variant of another word. Actually, there's a couple different eight-letter variants that you could play meaning the same thing, but only one will allow you to win. Make sure to adjust the final score correctly; the unseen tiles are EGMW. What is the eight-letter variant that wins the game, and what's the final score? What is the eight-letter variant that will still lose you the game (no matter how impressive)? What is the main word that both variants refer to? Q: Use the following ten racks of letters and find out which one provides the best bingo (bonus) play on the board: RETNNAV, KIETBRU, OLSSSUO, MERCSNI, SMMIEIS, KHOPARE, EXEHEIR, GDARUIS, RRICANO, CBITRUU. All words are Halloween related, from past Bingo of the Days. A: Out of the ten racks, only 2 allow you to use all of your letters for a Halloween-themed bingo play. The highest scoring play would be from the rack CBITRUU; you can spell out CUCURBIT on the board left to right, using the C in CADETS. You can use the C already on the board as either the first or third letter of CUCURBIT for a total of 66 points. The second bingo play is from the rack OLSSSUO, which also uses the C in CADETS, spelling out COLOSSUS for 62 points. The following racks can spell seven-letter words, but cannot be placed on the board: KIETBRU (BURKITE), SMMIEIS (MIMESIS), EXEHEIR (HEXEREI), GDARUIS (GUISARD) and RRICANO (CARRION). These racks could spell eight-letter words if their needed letter was open on the board: RETNNAV (REVeNANT), MERCSNI (CREMaINS) and KHOPARE (REAPHoOK). RETNNAV can also spell VERNANT, a word in the CSW12 but not in the OWL2. Also, it's not a Halloween-related word. Bonus: Since the above task was a laborious one, there was an additional rack with the letters PIRSAOE which would allow you to spell out a 765-point play on the board. A: The huge scoring bingo play was ANTHROPOPHAGIES across all of row 15, using the three words (NTH, OP, HAG) already placed on the board. This is placed on all three open TWS (triple word score) premium squares—a triple-triple-triple play! There's so many variants out there, it's hard to choose a favorite, so here's a few that I know off hand. Also: MESHUGAH, MESHUGGA, MESHUGGAH, MESHUGGE. The noun would be either MESHUGAAS, MISHEGAAS or MISHEGOSS. If you were to call somebody a crazy person, they would be a MESHUGGENER(s).